But when Morgan discovers that the one person in the world she trusted most has kept a devastating secret from her, Morgan must redefine her life and herself. It sounds awesome and I love the cover and the title. Annnnd... Sisters Red by Jackson Pearce. Little Brown, June 2010. Y'all know that I loved Jackson Pearce's As You Wish (so much so that I nominated it for a Cybil! ), so I was very excited to get my hands on this one (although the books sound very different). Scarlett March lives to hunt the Fenris - the werewolves that took her eye when she was defending her sister Rosie from a brutal attack. Armed with a razor-sharp hatchet and blood-red cloak, Scarlett is an expert at luring and slaying the wolves. She's determined to protect other young girls from a grisly death, and her raging heart will not rest until every single wolf is dead. Rosie March once felt her bond with her sister was unbreakable. Owing Scarlett her life, Rosie hunts fiercely alongside her. Now Rosie dreams of a life beyond the wolves and finds herself drawn to Silas, a young woodsman who is deadly with an ax - but loving him means betraying her sister and has the potential to destroy all they've worked for. 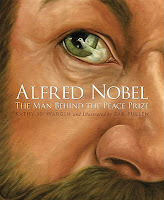 And this might have been this week or last week, but I was lucky enough to win a copy of Alfred Nobel: The Man Behind the Peace Prize by Kathy-Jo Wargin, illustrated by Zachary Pullen from a giveaway at A Patchwork of Books! And those are the lovely books in my mailbox this week. What was in your mailbox? Looks like you got some good books. I love the cover of Sisters Red and The Sky Always Hears Me sounds really good. Sisters Red looks really good! I didn't know anything about it and now I want to read it! Hope you enjoy all of those. The Sky Always Hears Me sounds *amazing*. Great books. Hope you have lots of fun reading them! Great mailbox. The cover of Sister's Red is beautiful. I just started following you. Come check out my blog.. These look terrific! I am especially interested in The Sky Always Hears Me. Sisters Red has a gorgeous cover! Happy reading.